In the week before the contest weekend HF conditions were just amazing and everyone was hoping for excellent activity on 15 and 10m. Unfortunately a sudden solar event almost killed 10m propagation except for North-South paths, Canada to the Caribbean was pretty good at times and even from the Caribbean to Mike VP8NO We must hope for better in 2012. This must have been one factor in the reduced entry (see the analysis here). Participation was down in the Open Section, by UK stations in particular and elsewhere in VK/ZL. The VU Team were decimated as a result of a major VU7 expedition in which most of the leading lights were involved. VU2PTT decided to act as HQ station which was a good call. They should be back in 2012. 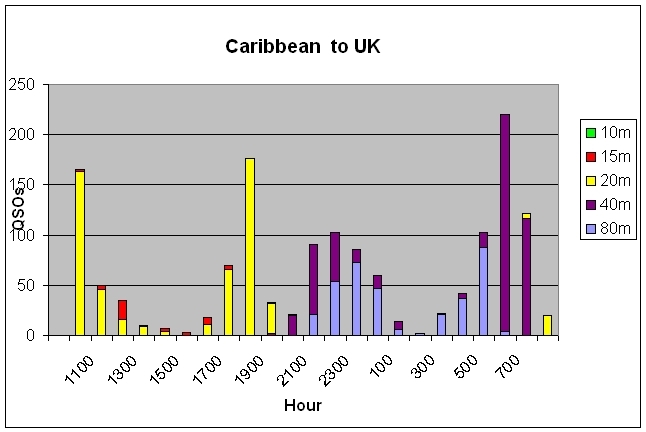 This graph shows the pattern of propagation from the Caribbean to the UK (tnx J88DR,VP2V/G3PHO,8P6DR,J68PJ, VP2MXF). There were no 10m QSOs. With a score of 10595 from 883 QSOs, John, VE3EJ, strengthened his grip on the Senior Rose Bowl with another convincing win in the Open section. John had a big lead over fellow Canadian, Ron, XL3A, (8645, 729 QSOs). John’s ability to wring out more bonuses out of the bands accounts for much of his success over the years. He managed 309 to Ron’s 250. Of the top 10 places no less than 5 went to VE stations. Canada really pulled out all the stops this year. In 3rd place with 8440 from 744 QSOs is DX traveller extraordinaire, Nigel, G3TXF, operating from the Gingerbread Hill Villa as VP2MXF. 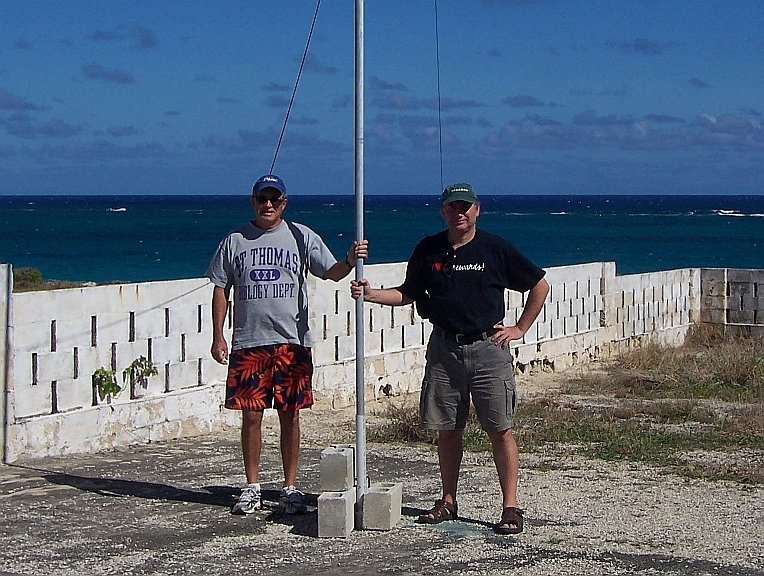 Alan, P3J, was 4th (8140 from 884 QSOs), and Dave, J88DR, 5th (7805 from 629 QSOs). 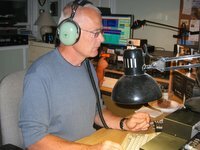 Leading UK station in 12th place was again Gerry, GI0RTN, (6120 from 320 QSOs) operating G6PZ and thus he retains the Col.Thomas Rose Bowl. Leading VK station was Barry, VK2BJ, in 11th place but the highest ZL station was Frank, ZL2BR in 31st place. The Restricted Section again showed a small growth in numbers, underlying its growing popularity. It is becoming especially popular with the DX Travellers who took 5 of the top 10 places. Overall winner of the Junior Rose Bowl by a good margin was Yuri, 8P9AA (VE3DZ). Yuri ran 100 watts from a K3 to a 43′ vertical fed via a 4:1 balun. A very simple set up. 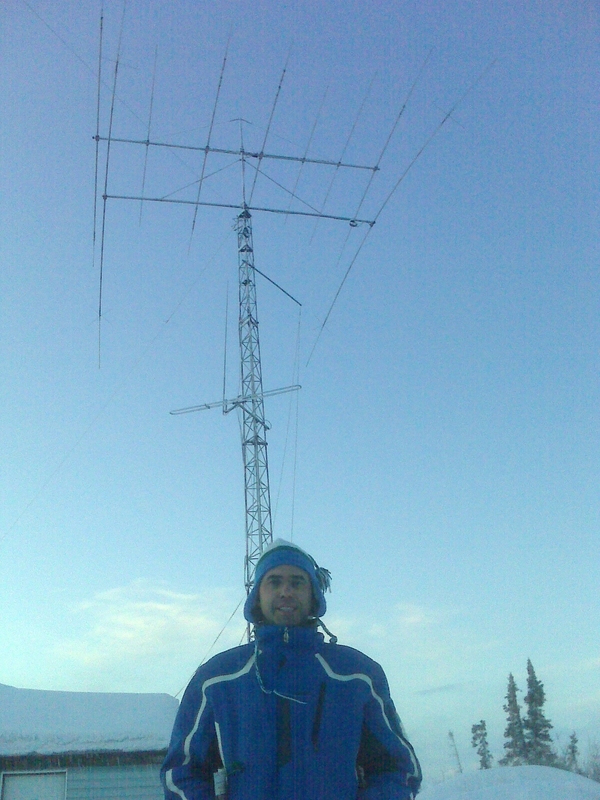 Here is Yuri (right) with Peter, 8P9NX (left) and the base of the antenna. But just look at that sea view!.Yuri’s score of 7900 from 608 QSOs would have placed him 5th in the Open Section! It just goes to show that the old adage ‘location, location, location’ really applies! Have a look at Yuri’s comments on the Soapbox about unwanted callers – there were plenty of those this year! 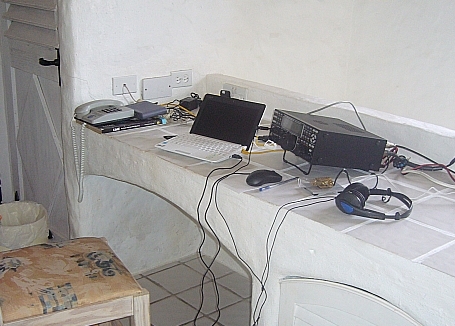 With 7005 from 561 QSOs and in second place was Bob, J68PJ, who used a similar set up, a K3 and 100 watts to a vertical doublet for HF and a sloper for LF from a site on the cliffs at the north end of St Lucia. Details here. Peter VP3V/G3PHO, was 3rd with 6560 from 588 QSOs. Followed by Richard, 8P6DR, in 4th (5995 from 467 QSOs). 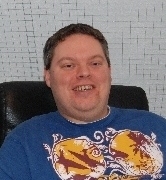 The highest placed UK station, Peter, G3LET, was 5th (4785 from 221 QSOs). Peter wins the John Dunnington Trophy by being the highest placed UK station who has not won the trophy for the past 2 years. Here is the shack, BiggIR and long wire skyhook. 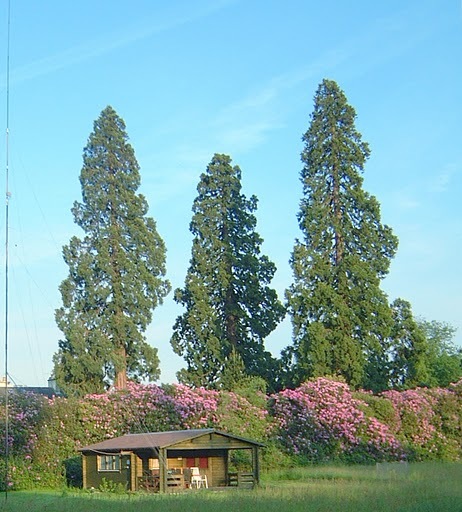 The 250 ft invisible sloping wire antenna used on LF is supported by the 150ft sequoia to the right and fed in the shack against 6 radials, each 40 ft long, which are laid out in the direction of interest. 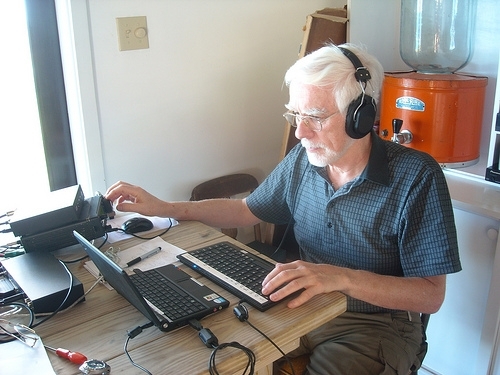 GB5CC, operated this year by Chris, GM3WOJ, from the GM2V contest station near Inverness,regains the leadership of the 4 HQ Stations, GB5CC, VA3RAC, VE7RAC, and VU2PTT which were active. Nine stations entered the Multi-operator section which was won by VE3RZ (6400 from 472 QSOs). With the advent of RBN/Skimmer as well as Cluster it is expected that this section will grow in the next few years. The award for the highest placed non-UK station who operated for 12 hours, the VP8GQ award, goes to Mike, 5H3EE. The Ross Carey Rose Bowl goes to Bob, MD0CCE, as the highest placed UK station who operated for 12 hours. Some 10 entrants travelled to Commonwealth countries specially for the contest or were on DXpeditions at the time. This year the award is made to Peter, VP2V/G3PHO. 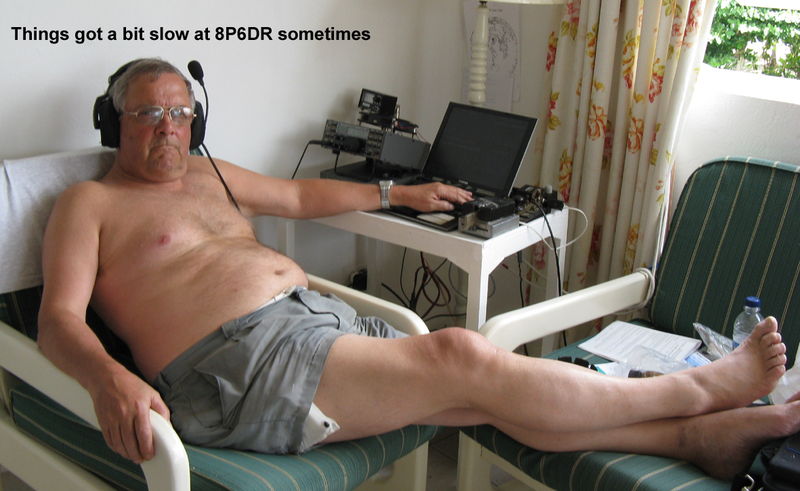 This was Peter’s first BERU DXpedition. 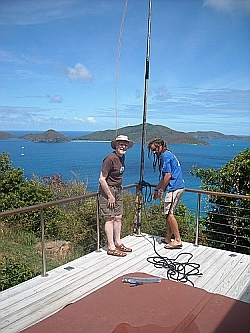 Like many of the travellers he used 100 watt to wire antennas but from a specially selected site on the BVI. We know he enjoyed the trip and so we hope he will do it again! And you can see the other Travellers comments here and especially read about Chris VO2AC trip. Not everyone went to hot places!! The QRP entrants scores were: G3LHJ – 1600 , VA3RKM – 1575 , VE5VA – 860 , VE7BQO – 685 , G3YMC – 660 , G5CL – 375 , GW0VSV and G6CSY, both 225 , VK4TGL – 200 Congratulations to Derrick, G3LHJ. The Commonwealth Medal is awarded to Dave Cree, J88DR, (G3TBK) for all the bonuses he has given entrants over the years he has operated from J8 and for his enthusiasm and support to the Team Contest and the Rest of the Commonwealth team in particular. Thanks Dave. In General > amazing what you can work with an antenna at 15′ (G0MTN), not many VKs and ZLs (G0HVQ), Roll on 2012 (C4Z). The hoped-for better conditions, promised by the state of the bands in CQWW the week before, failed to materialise. High noise levels and lack of HF openings were the order of the day and this is reflected in the reduced number of entrants, compared with 2010, in their soap-box comments and in the generally elevated error rate.A small number of entrants experienced problems uploading to the Robot and, on receiving warnings, contacted the adjudicator for assistance. Most of these difficulties were due to formatting errors caused by logging software not compatible with the contest and all were finally overcome. There was the usual small number of hand-written logs, and one on a floppy disk. These continue to be welcome. The latest upgrades to the checking software enable the fabrication of a ‘virtual’ log for EVERY callsign appearing in the entries. Automatic checking for near matches and flagging of uniques complete a trio of very useful tools for the adjudicator. This year, over 600 virtual logs were created. Of these, just over half were identified as genuine participants making multiple QSOs. Of the remainder, all but 61 contacts were eventually confirmed as “busted calls”. Another useful facility provided is the ability to generate a list of an entrant’s contacts where the OTHER station made an error. This provides a check against mis-logging of sent serial numbers and incorrect logging of band-changes. Quite a few entrants, initially assumed to have made receiving errors, had their points reinstated after detailed checking … and, of course, the sending stations at fault picked up the penalties instead. The 75th Commonwealth Contest will take place from 10th to 11th March 2012. As this will be the 75th contest there will special celebration prizes etc. More details later. Why not make plans for a DXpedition to celebrate.